Our Ancestors maintained the earth GREEN by being close to nature. They built massive structures with Natural- Resources. TARGET EQUIPMENTS were indeed master-builders who created all GREEN –BUILDINGS. Our Ancestors used mass and moisture and simple Evaporative Air Cooling Techniques innovatively to keep Indoor, Environmental, Quality (IEQ) cool and comfortable, consuming very little or no energy. Specially Designed and developed Evaporative cooling system using principle of natural evaporation of water to cool hot and dry air. 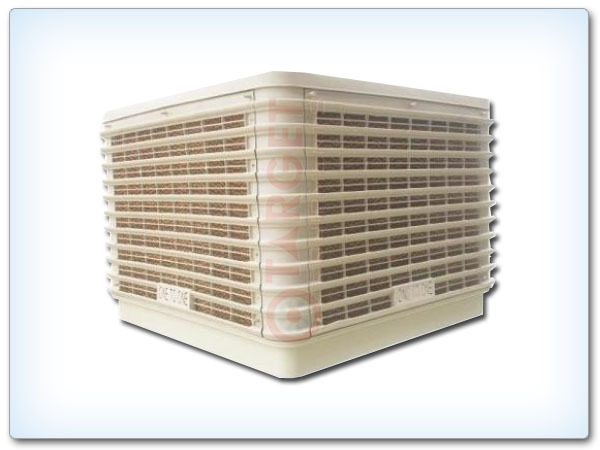 Keeps indoor Environmental Quality (IEQ) cool, comfortable and Fresh and Healthy. Compact, light in weight and easy to dismantle, assemble and install. Simple to operate with negligible maintenance. Power consumption 1/10 Th of air-conditioning plant. Highly economical in initial and running cost. Fitted with High Cooling-Efficiency (Above 86%) cellulose pad. Fabricated from polyester coated G.I sheet for long life and elegant looks. Dynamically balanced fan blade for low noise/low power and high air delivery. Tailor made energy efficient motors ensure low power consumption. Submersible impeller pumps to avoid air lock and priming. Regular features like bleed off/Auto cut valve and rubber Mountings.